A common challenge of organizations is defining what is valuable to their business. What is valuable then could be defined and then the risks determined. The classic risk management process would (not) conclude with deploying safeguards and practices to minimize the impact of any event related to this data, but also extend to a commitment of reassessment and reconfiguration / shifting of safeguards and position. To be specific: Valuable to an organization may be the root password to their latest and greatest appliance. The need would be identified by technology and business leaders that protecting this code extends their ability to remain competitive. The release of such key lowers said risk, especially as in many cases one insight leads into other insights quite rapidly. This was shown clearly by the re-tweeting of a PS3 representative that included the master key for the PS3. Here is an article explaining it very plainly. The individual tweeting it, did not know it was sensitive or its meaning. This highlights a critical point in this model whereby the whole structure relies upon the first premise – defining what is valuable. Envision a pyramid… the top is the what is valuable to an organization, and layer by layer down the pyramid you have the traditional risk management process. (This may be ISO 27001, OCTAVE, or others…) The point being that as the pyramid is built there are safeguards, cost, management participation, and deployments, re-configurations, and such continuously…ALL based on the single assumption of the value being known. Now take that pyramid and flip it over. The challenge becomes clear – the first assumption is now holding the entire program up. I love this analogy because it highlights to everyone the importance and critical need to properly identify what is valuable information and then communicating and safeguarding it properly. The safeguards must consider each representation equally and evenly to ensure that the valuable items are protected. Otherwise as has been proven time and again, the weakest link will be exploited. There are many aspects of a risk program, but the linchpin starts and ends at defining what is valuable. The tweet referenced above and below is a single representation of this fact. See you at RSA SFO 2011!! Sensitive Data leaked onto P2P networks… how to safeguard assets? An article was highlighted in a LinkedIN Group (that spawned a discussion) published by SC Magazine entitled, “First lady’s safe house location leaked on P2P“. The article breaks down the concern that lawmakers and regulators have with P2P networks due to the recent release of sensitive data. You can find the article here, and the U.S. Committee on Oversight and Reform transcriptions & webcast here. The chairman’s closing remarks (short) are here on “predator-to-prey” networks. I strongly advise reading through these to understand the current risks and perception of risks that exist. The article is a good overview of a problem, but I would contend that the attack / threat / vector is not as described by the testimony or highlighted in this article. They state the problem is the P2P technology that lead to the disclosure of the sensitive data. That is similar to blaming the highway to causing an accident. Professionals within the business of protecting assets and managing operations must have safeguards for the data that transcends the risks of the technology. It is dangerous, and unfortunate that the committee seems to be hunting for a culprit that can be regulated, to assume and believe that P2P is the simple problem. When in fact it is the current state of security within the Nation’s critical infrastructure, and this is as much an internal people problem as an internal technology compliance problem. I do agree with the elimination of software that is known to be at risk to attack, but in the client-browser attack world we live in today that would include things such as Internet Explorer! Removing access to Torrents and other p2p networks only stifles innovation and increases costs. A more risk aware and intelligent method needs to be devised that allows the government to gain access to valuable resources without placing sensitive information at risk. Order my book online at Amazon where I elaborate on how to develop an Enterprise Risk Management Program, based upon NIST and years of client engagements. 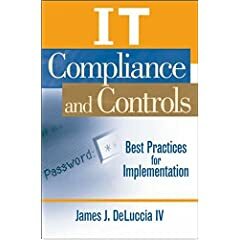 JDeLuccia: I have always thought the scope of #PCI should be any SYSTEM / ENTITY “…that stores, process, transmits” + MANAGES “…card holder data!